The vast beauty with an emphasis on monochrome and flatness is distinctively characteristic to the Han River embankment, forming a major attraction to locals and international tourists visiting Seoul. It is one of the main images related to the city and of enormous relevance to its identity. 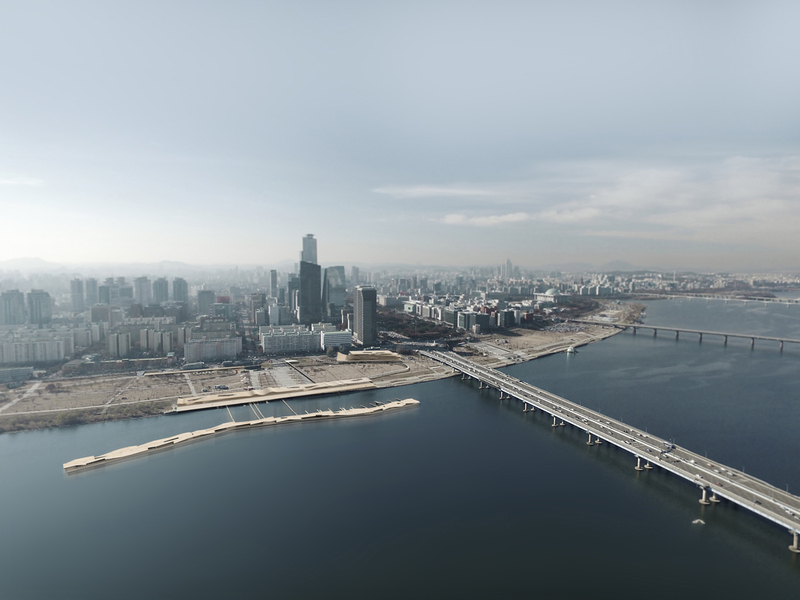 The new cultural and transportation development on the south side of Han River between Mapo and Wonhyo Bridge aims to maintain this unique character of the site and to implement social, cultural and infrastructural improvements within the aesthetic and environmental context, setting an example for Seoul’s sustainable and holistic future development. The masterplan considerately relates the development to the existing infrastructure and public transportation network, while creating a destination by, and with the Yeoui-Naru Ferry Terminal specifically, on the water. The terminal and marina facilities are directly connected to the Yeoui-Naru Station via the proposed link bridge, which provides an easy barrier-free connection to all parts of the new development and public transportation facilities. While the interchange creates a direct shortcut between the subway station, the ferry terminal and the pier deck, a gently curved ramp that follows the existing paths and topography connects the development with the alternatively proposed Ari Art Center and the Yeouimaru above the existing open public car park at Mapo Bridge and taking a turn back towards Yeouijeong (Pier Deck) without interrupting the existing landscape. 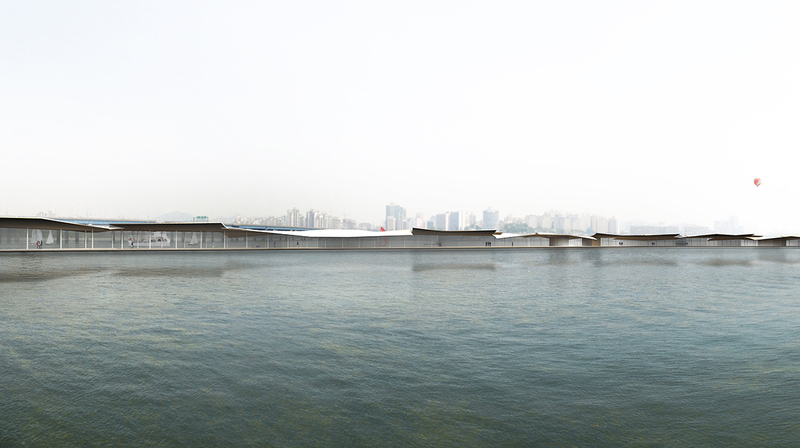 The Yeouijeong (Pier Deck) is proposed as a one storey open timber structure with shutters, located by the water on the designated concrete paved area opposite to the terminal and marina facilities. It is conceptualized as a market hall typology with cafes and restaurants, offering typical local culinary experiences, such as Korean Barbeque, Chimaek in flexible enclosed, open and semi-open spaces. The enclosures are proposed as temporary flexible structures, which can adequately respond to future expansions and changes as they are easy and cost-effective to secure, maintain and replace due to flooding. The 8,500 sqm rooftop of the Yeouijeong serves as a vast observation platform, overseeing the Han River and the marina facilities. The building spans over the non-construction zones of the middle section, where the structure crosses the subway line, with no underground foundations set in this zone. The masterplan reserves an elongated area east of Yeoui-Naru Station for the Yeouimaru (Yeoui Terrace), a two storey high building on raised platform terraces, overseeing the landscape of the riverbank with parts of the Ari Cultural Center can be integrated in this zone. Alternatively, the proposal suggests the Ari Cultural Center and parts or the entire Yeouimaru could be located on top of the open parking space south-east of Mapo Bridge. This location is identified as a strong anchor point to connect the entire cultural development with the urban grain, by placing a four storey landmark structure at the entry point to Yeouido, while creating a recognizable visual connection to the Yeouido Park and the financial and government district. The masterplan together with the Yeoui-Naru Ferry Terminal creates social and environmental relevance by responding to programmatic and contextual relationships, as structures and functions are treated as a coherent entity to establish Yeoui-Naru’s new cultural identity. The one storey, 5 meter high, terminal building forms a thin line, following the river flow. The slender ratio of facility length to width is the conclusion from maximizing efficiency, providing spaces for up to seven 700 tons vessels to berth at the same time and 20 private boats along with other tourism and transport vessels. The slight bends of the terminal and the marina facilities are the result of optimization for vessel manoeuvring, while creating a definite path on the otherwise undefined water surface. The terminal is located furthest possible from the shoreline within the planning zone to emphasize the experience of “walking on Han River” and to distinct between land and water side. The entire Yeoui-Naru Ferry Terminal and marina facility is sheltered by a continuous roof, creating a quality which is currently lacking on the vast embankment and leading to many visitors bringing along tents or picnicking under the bridges, especially in summer time to seek shelter from the sun. The subtly bent and gently waving roof structures create shelter as they frame the views of the river and the city in alternating opening and closing gestures. The undulating roof surface creates varying light qualities. The lightness harmoniously corresponds with the flow of river and creates a poetic interpretation of Yeoui-Naru symbolic identity. The elongated structure is slightly bent in parts to optimize the manoeuvring space for the berthing vessels, creating a distinct path on the river. The different pier sections become distinct destinations on this 14 meter wide path. The slender pier structure is wide enough to provide visitors with a feeling of comfort and security on the floating platform. At the same time it is narrow enough to create the unique experience of “walking on the Han River”. 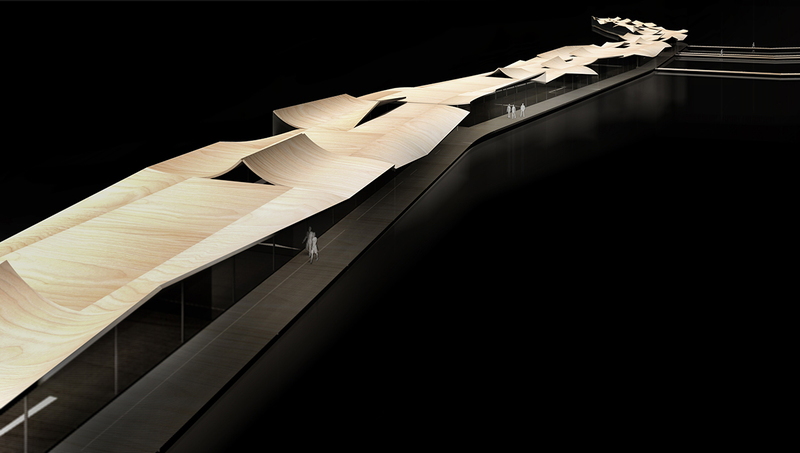 While the areas and dimensions are highly optimized, the result is a structure, which allows visitors to experience an intense connection with the flowing river. The Yeoui-Naru Ferry Terminal integrates the terminal building with its associated pontoon area and the marina facilities into one structure, totalling 5,400 sqm, to create the most efficient ratio of the required footprint. 424 meters long, it provides spaces for up to 7 vessels of up to 700 tons each to berth at the same time with separate controlled access zones for 20 private boats and other vessels. The terminal facilities are sequenced along the central spine of the marina, creating ticketing and waiting spaces alongside logistic and office areas and cafes. The layout is flexible to adapt to any future possible changes of use and expansion or reduction of enclosed areas. The private pier on the south-west side of the marina is separated from the public pier by the administration, storage, shops and cafes. The Yeoui-Naru Ferry Terminal together with the marina facilities present a singular coherent form. The diagram of the two functions running parallel to each other with the central terminal and the marina on the two edges offers visitors seamless connection between indoor and outdoor facilities. The linear sequence of cafes, waiting rooms, exhibition areas, multi-function event spaces and offices are opened to panoramic views over the river and the park. The terminal incorporates a rooftop observatory that provides views of the Han River, Yeouido Hangang Park and Yeouido Park. An extended or the use of the entire roof areas as observation deck is optional. Travellers and the public can freely experience the building as a public open space on the Han River with designated zones for controlled access. The design generates social relevance to the infrastructure facility by its flexible programmatic relationships between indoor and outdoor spaces. Circulation spaces that normally act as in between zones that are meant to connect different functions have been reinterpreted as cultural and social streets that can be used by the public at all times, turning the pier into a community space filled with public life and content. Respecting the notion of building on water, the Yeoui-Naru Ferry Terminal is conceived as a lightweight steel-frame structure, creating a light appearance with reduced weight to minimize the pontoon size and blending harmoniously and naturally with its surrounding environments. A metal mesh encloses the periphery of the marina, creating an almost invisible curtain, in lieu of typical balustrades, eliminating the barrier between the pier and the river, as well as enhancing the safety in the event of higher waves. The modular structure of the pontoons is based on 14 by 8 sqm segments. Smaller modules of 3.5 by 4 sqm for the open and enclosed internal spaces, as well as the varying roof elements, create a plug-in system, which is easy and cost-effective in off-site production and on-site assembly, maintenance, replacement and expansion. The proposed marina facility already creates two more berthing spaces than required by the brief within the given GFA. The pier structure can be extended by additional modules. The structural grid is rationalized in modules to achieve efficiency, flexibility and expandability of the space planning. The standardized modules allow for expansion and flexible internal separations to accommodate multiple functions, events and activities. The building form is designed with flood prevention and water environment consideration of the Han River, avoiding potential interference with river flow and lead to a rise in water level in the event of a flood. The 4 Core Projects of the Han-gang Collaboration Plan encompasses pedestrian and bicycle paths within green open spaces and direct connection to the public transportation network. The Yeoui-Naru Ferry Terminal is conceived as a low-tech structure, minimizing resources in production, construction and maintenance. All materials are locally produced and manufactured. The timber decking of the roof, floor and internal partitions are constructed with locally sustainably grown timber, which enhances the indoor quality and reduces the building’s carbon footprint. The enclosed building parts are primarily naturally ventilated, with additional air supply being water pre-heated/pre-chilled and energy from the air-extract being lead back into the system via heat exchangers. All technologies employed are low-cost in production and maintenance. The building is designed to collect and recycle water from the river with natural filter system for greywater management. Deep roof overhangs provide shelters from harsh summer sun while the subtle curvature of the roofs filter light through into the spaces to create a sense of nature poetry. By establishing a holistic and intellectual design language and approach, the design aims to create a place that manifests the values of Seoul's progressive intellectual, cultural and technological development, which builds upon its unique millennials old history and traditions of Korea. The project is anticipated to be completed in 2019.